A few years ago I came across a pocket-book on the bylaws of eighteenth-century Amsterdam. Its very size made me muse about the kind of books you would like to carry with you, the actual choice booksellers offered and offer you in the particular field of pocket law books. With this post I launch a new series of contributions with the motto “Opening a book”. The book that prompted me to write about pocket law books has been digitized for the digital library Early Dutch Books Online (EDBO), the fruit of cooperation between the Royal Library in The Hague and the university libraries of Leiden and Amsterdam. Meanwhile EDBO has been integrated into the Delpher project of the Dutch Royal Library. An anonymous book called Amsterdams burgerrecht: Dat is Verzameling van privilegien en handvesten [Amsterdam’s citizens’ law, being a collection of privileges and charters] (Amsterdam 1787) attracted my attention because of words following the subtitle: “Uit de groote Handvest en andere schriften byeen verzameld, om als een zakboek van ieder gebruikt te kunnen worden”, compiled from the Major Charter and other writings in order to serve as a pocket-book for everyone’s use. Initially I was tempted to see this fifty page book as a typical product of the so-called Patriotic Period (Patriottentijd), the period with a strong movement in favor of political change in the Dutch Republic, but there is a much earlier edition from 1748. Both EDBO and Delpher are connected with the Short Title Catalogue Netherlands, the retrospective bibliography of Dutch books published between 1540 and 1800. The extensive information in these resources left me with one question, the actual dimensions of this book. I checked in vain the catalogues of the three libraries holding this book, the Royal Library in The Hague for the digitized copy, the university library at Groningen, and the library of the Rijksmuseum in Amsterdam. The copy at the Rijksmuseum is interleaved with pages holding notes said to date around 1770, and this made me wary. The collation, the physical form of this copy is slightly different, too, but this can be due to a mistake in checking the pages of this particular book, π2 A-B8 O6, at Amsterdam A-B~8 C~4 . Alas there is no image of the digitized book with a scale for dimensions or colors, something which you might take to for granted when digitizing old books and manuscripts. The contents themselves of this book – at least posing as a pocket-size book – on the bylaws and ordinances of Amsterdam are interesting. For readers in 1787 the stress in the first pages on the military duties of the burghers (citizens) was surely interesting. The importance of the old schutterijen, the Dutch city guards, had been curtailed by the Orangist government, and building new militias was one of the items on the agenda of the patriotic movement. The book gives for a number of subjects extracts in chromnological ordr.er from old ordinances, but the anonymous author gives the ordinances from 1394 partially in full length and places them prominently after the first short section about tolls. My insistence about the omission of the exact dimensions of this book is not a petty criticism or a hobby-horse. Dutch books in the seventeenth and eighteenth century were renown for the fine quality of printing and their handsome format. There is no need to remind English and American readers of the success of a series of short scholarly introductions which is surely due not only to the distinct quality of the authors but also to its handy shape. Germans know the Reclam’s Unversal-Bibliothek with cheap but reliable text editions, and the French have the Que sais-je series. 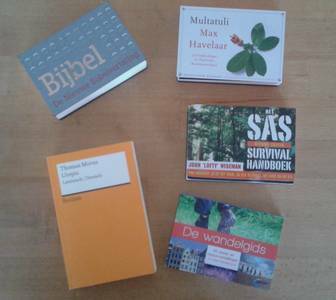 Since 2009 a Dutch publisher has gained considerable success with really small pocket books containing texts printed crosswise (dwarsligger) measuring just 12 by 8 centimeter. The Reclam volume on my photo measures 15 by 9,5 centimeter. Lately I bought two pocket books giving you access not just to Dutch law in general, but doing this in a translation into easily understandable Dutch, meaning without juridical jargon. 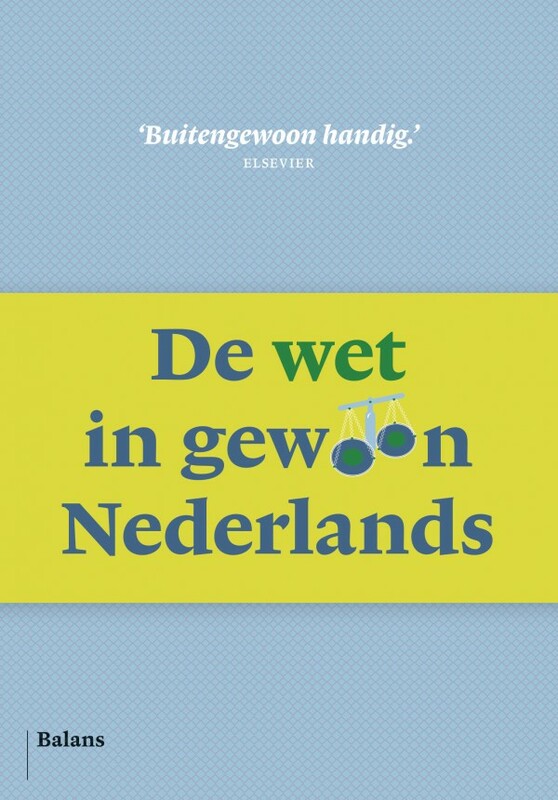 De wet in gewoon Nederlands [The law in normal Dutch] by Douwe Brongers (Amsterdam 2007, 4th ed. 2013; 703 pp.) starts with two documents from another legislative level, the Universal Declaration of Human Rights and the European Convention on Human Rights, followed by the Dutch constitution, and large sections of the Dutch codes of civil law, criminal law and court procedure. Brongers brings in a second volume, De rechten van iedere Nederlander [The rights of every Dutchman] (Amsterdam 2013; 208 pp. ), laws on consumer rights, privacy, equality, door-to-door selling and internet trade, the national ombudsman and the special children’s ombudsman, personal identification, governmental publicity, and the law concerning labour conditions. Their size, both in the number of pages (700 and 200), and physically (16 x 11,5 cm) make them less comfortable as books which you would really put into the pockets of your coat. The idea of combining compact size, concise information and clear language is indeed appealing. Even legal historians use sometimes the pocket size for their publications. Julius Christiaan van Oven wrote a small book meant to guide his students attending his lectures at Leiden [Overzicht van Romeins privaatrecht. Leidraad bij een inleidingscollege (first edition Zwolle 1934; 7th ed.,1964)]. There exists even a pocket-book edition of Justinian’s Digest [Digesta Iustiniani Augusti, Pietro Bonfante et alii (edd.) (2 vol., Milano 1908-1931; reprint 1960 in one volume)]. In our century of electronic publication it should come as no surprise to find both a digital and a print version of J.E. Jansen’s study guide Romeins recht (2nd. ed., Amsterdam 2014), a volume in a series with more than forty short and small-sized introductions to the various fields of law. Does this post gives you a taste of more?! You can tune the great database behind the Short Title Catalogue Netherlands to give you any book printed in a particular bibliographical format, but it depends on the data in the catalogues behind the STCN whether you will find the actual dimensions of a publication. Using words like zakboek or zakboekje and older words such as compendium you can spot a trend in Dutch book titles during the last quarter of the eighteenth century, but this is not the first period of the use of these words in book titles attempting to attract the attention of buyers. Pocket-books on law in the late eighteenth century shared for example the company of books on gardening, horse riding, veterinary medicine and freemasonry, and you will find books with a clear political aim, too. Almanacs used to be really small, and their modern incarnation such as the Enkhuizer Almanak bear witness to a clear standard size surviving the centuries. The Dutch Royal Library has recently created an overview of digitization initiatives in the Netherlands, and with some luck you can still access, too, a useful list with the actual URL’s of digital collections, in my view an essential asset inexplicably missing in the final report Bibliotheekcollecies in het netwerk published online in August 2015. For your convenience I have created a shortlist of the main relevant collections on my page for the history of Dutch law. This entry was posted in Digital editions and tagged Books, Legal history, Netherlands, Roman law on September 10, 2015 by rechtsgeschiedenis.